While we try and make each post meaningful (or at the very least enjoyable) for our kids, sometimes things are just for cute’s sake. These pennant flags definitely fit that description and you can see it all over Dash’s face, he doesn’t get the hype. But, we’re digging them (anything in French usually wins us over) so maybe you will, too! Stiff felt (you can buy it in sheets at the craft store.) Wood dowels, soft felt for lettering, scissors, a hot glue gun and a printer if you want letter guides. 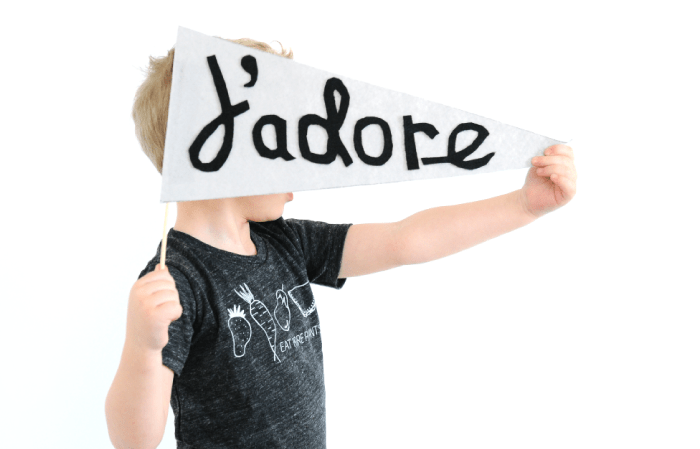 You can buy pre-cut stiff felt pennant flags, but if you want more options color wise, you can easily cut your own, and they’re a lot cheaper too. They’re usually 9 inches wide and 18 inches long, so find the center of the felt, count out 4.5 inches on either side and mark with a pencil. Then mark the very center of the other side as your angle guide. Take a ruler, and connect the markers to create your pennant shape. Then cut it out and you’re ready for lettering! The lettering can be done one of two ways, you can print off guides with your favorite font in a word document, (starting with 8 inches tall and slowly tapering down in size) and use them as a guide while cutting the felt out. Or you can eyeball it. Eyeball it! Eyeball it! We’re cheering you on, because really cutting out a guide is sort of annoying. Obviously we went the eyeball route, and they’re not perfect, but they’re totally personalized and after that much labor, Emily wouldn’t sell them for $1,000. Consider them a new family heirloom! Once you have your letters cut out, simply hot glue them on, and then on the back hot glue the dowel to the widest part of the felt. To keep it clean looking, we cut out a piece of the extra stiff felt and glued it to cover the dowel and secure it a little bit extra. (Refer to the final step in the tutorial collage to see what it looks like finished. Emily has them sitting proudly on her table in a vase, we’re thinking they’d look pretty good hung on the wall too, or maybe they’ll come along to embarrass her husband a bit at his next softball game. Endless possibilities! Need more Valentine’s Day inspiration? Check out our boys’ Valentine’s cards from last year, a playlist of our favorite kid-friendly love songs, and we heard the Babushka Valentine’s printable was giving some of you problems, if that’s you, email us directly and we’ll manually send the file! I love this so much!! I will definately try these with my boy!!! Thanks for sharing!! These are adorable! Any idea where that cute “Eat More Plants” shirt is from? Love it! 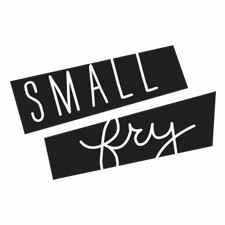 I have never much liked Valentine decorations until Small Fry came around. You guys brought a fresh look to the pink hearts. Now, I hope you’re coming up with some rad Easter ideas. That’s the other holiday I always struggle with. Mahalo nui loa! These flags are so cute!! Thank you for the great idea!! This is a really cool idea. My girls will love it. My husband has a bunch of really cool vintage pennants from when he was a young boy and they’re so cool! I always wanted to hang them in the girls room but they don’t like them!! I’ll bet they’d love these! I want to make these so badly. I’m trying hard not to forget all my responsibilities of the day and go make these.